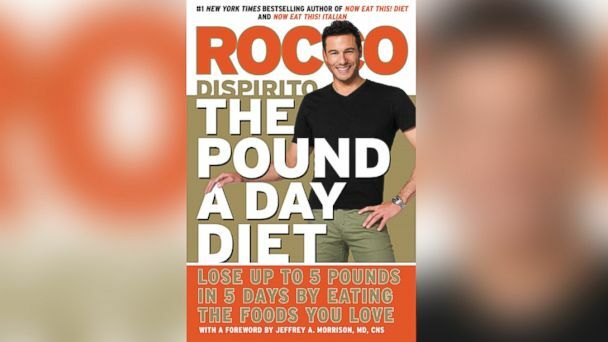 Rocco DiSpirito is known for his delicious meals and now the celebrity chef says you can eat what you love and still lose weight with his "Pound A Day Diet." The goal of his new diet book: to help dieters lose up to five pounds in five days. Part of the appeal is quick weight loss, so dieters feel motivated immediately, and DiSpirito says the fact that it's from a chef's perspective distinguishes the plan from others. "It's a chef's point of view that's been missing in the world of health," DiSpirito said. "These recipes are easy to make and they taste great." DiSpirito says the diet turns your body into a fat burning machine. In phase one, you consume lots of water - half your weight in ounces every day - and six small protein-packed meals, totaling 850 calories a day. More calories are permitted on the weekends for a month. In phase two, you get to eat more, but learn to keep the weight off for life, he says. "It's got 30 grams of protein. The reason I put so much protein in this chocolate smoothie is because it is breakfast and protein is sustainable fuel. It'll last throughout the whole day," he said. Don't have time to cook? No problem, DiSpirito says. "If you still don't think you can do a five-ingredient, ten-minute recipe…. You can do my 28-day Phase One with store-bought food if you really want to." While a diet designed for quick weight loss can help keep dieters on track, experts say in some cases that can actually be associated with real risks, including electrolyte abnormalities, cardiac consequences, and multiple other medical issues, according to ABC News' Dr. Jennifer Ashton. DiSpirito maintains his diet is safe and was created with the help of a doctor and filled with micronutrients that other aggressive diets may lack. Recipes from THE POUND A DAY DIET by Rocco DiSpirito. Copyright © 2014 by Flavorworks, Inc. Used with permission by Grand Central Publishing. All rights reserved.